The photos here are of my 1905 Alldays Delivery Tricycle, which was used by a firm of Gent’s Outfitters in Liverpool. I did a search on the name Watson Prickard when I bought the Alldays. I was surprised to discover that the company still exists, though they closed their Liverpool shop and are now in Southport. You’ll observe in the Alldays catalogue at the top of the page, commercial handcarts or, as they’re called there, Hand Parcel Carriers. 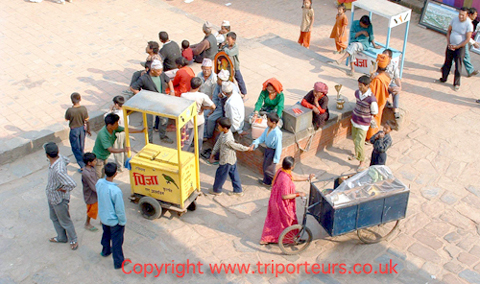 In poor countries such as Nepal and India, such handcarts are still in use. I took the photo below in Nepal. This Pashley 3-wheeler was used for local supermarket deliveries. As I’m more of a motorcyclist than a cyclist, there’s always a temptation to put a cyclemotor engine on something like this. Especially as we live on the side of a very big hill. However, the Pashley is so charming already that so far I’ve resisted the temptation.